Something I hear a lot is how it’s so confusing using UK and US crochet terms and stitch names. Let’s face it, when you are a beginner you don’t need to be learning the lingo too. Here’s a new stitch conversion chart for you (updated from my popular old one). Just save the image, print it in landscape, then flip the paper over and print the other side. Bingo! You have 3 charts, 1 for your essentials bag, 2 for your mates (or keep them as bookmarks). 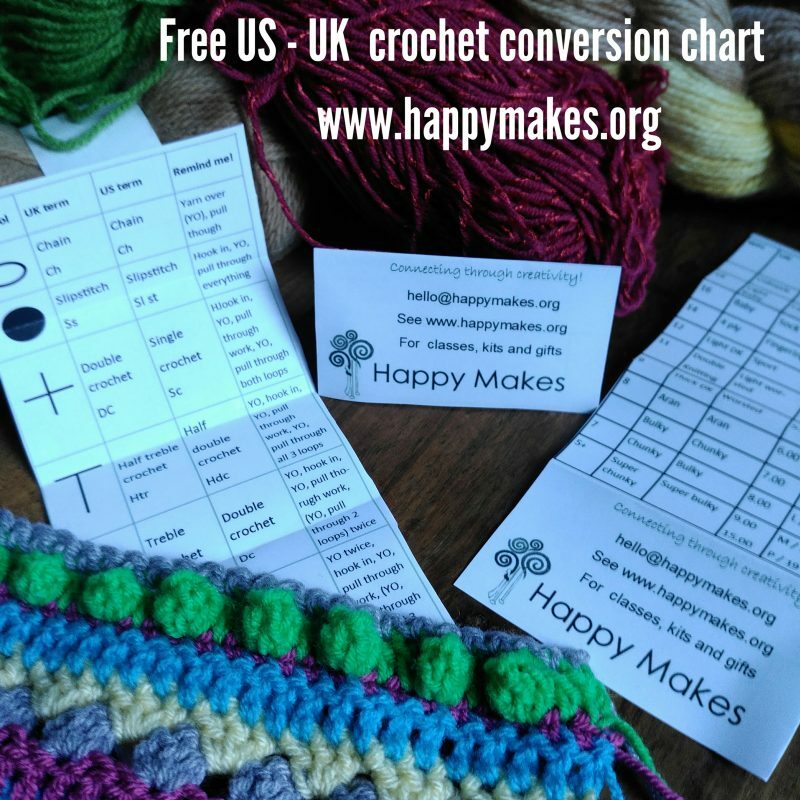 Folded, they are less than credit card sized and perfect for keeping in your purse or wallet so you can check the wraps per inch before you buy that impulse yarn, or double check how to make a UK double crochet stitch. This piece was commissioned by Dr Liz Granger from The Young Scientist Centre at the University of Central Lancashire, Preston, and funded by The Physiological Society. Our brief was to respond creatively to the problem of having too few activities for younger children at The Young Scientist Centre. After a few sketches, we decided on how we could make an interactive body full of things to play with, to help engage young people and be a learning aid. It was an ambitious project, which we decided to share with some victims wonderful volunteers. The most tedious part was probably knitting the small intestine, which was proper ‘plodding’ knitting and seemed to go on for weeks. We tried to share it around and I took my intestine out to several cafes and soft play areas during school holidays. The most exciting part was undoubtedly seeing the bodies completed. They even decided to drop into our ‘Woolly Thinking’ exhibition at Oxheys Mill Studios! I was delighted to be involved in this project. All the volunteers, my family, and I learnt things about how our bodies work. 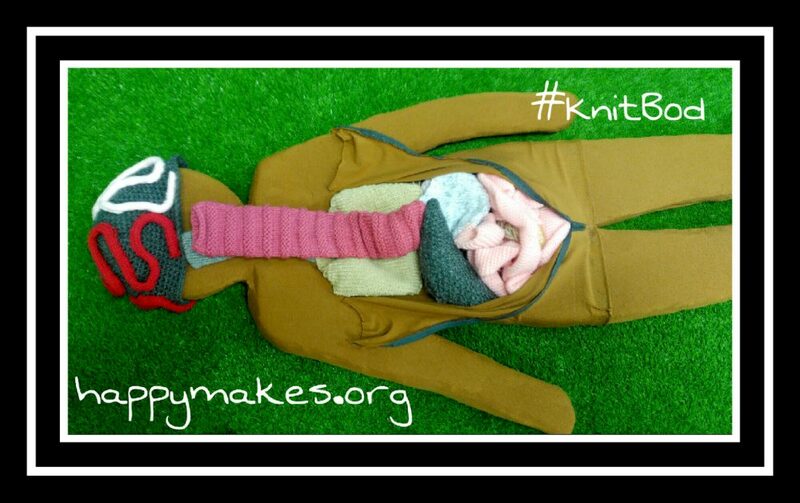 If you want to knit your own body, sign up for the Happy Makes newsletter and you can download the patterns for your school or group – Free! Signup here. *Caroline Finnigan is an artist with studios at Oxheys Mill Studios, Preston. 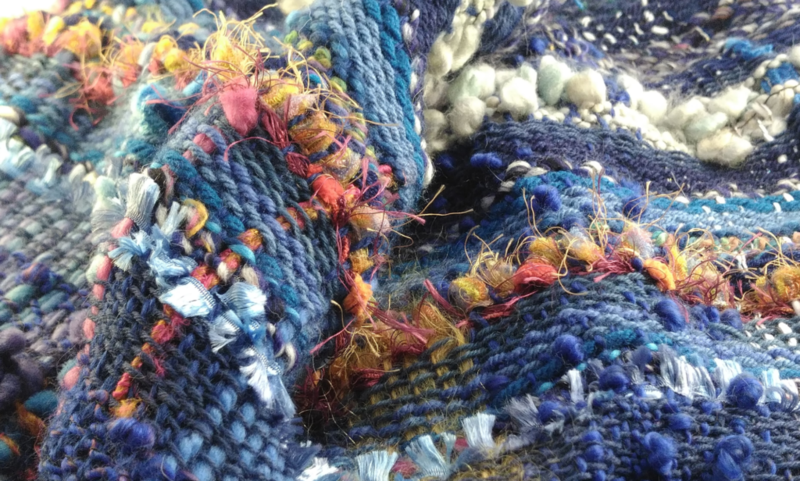 She teaches knitting, crochet and other crafts, enjoys photographing things from strange angles and lives with dotty 2 cats. We have already made the organ patterns the size you need for your body, so there is no scaling to do. You just need a body. Here’s how we made ours. Foam – I used 2 pieces about 1 metre long, 50cm wide and 2.5cm deep. Draw a child on a roll of paper – I cheated and drew around my daughter, who was a smallish 8 year old at the time. Stick the 2 pieces of foam together to make a piece about 5cm thick. Copydex spread thinly works, or a hot glue gun. I’m sure there are lots of other suitable glues. Transfer the drawing to the foam using the chalk. Make sure the neck is wide enough to support the head and check it looks in proportion. Stand back and check it looks in proportion again, making any necessary changes. Make sure the glue is dry and, using sharp scissors, cut out the body. You can round the edges by holding the scissors at an angle. Hollow out the chest cavity through one layer of foam. Once you are happy with the body, use the hot glue gun to stick fabric to the back then front of the skeleton. You may want to stitch it for a better finish, in places like the arms and legs. Cut an extra piece of fabric to cover the top of the chest. Cut it in half and sew in a zip. Glue or sew the chest onto the skeleton.